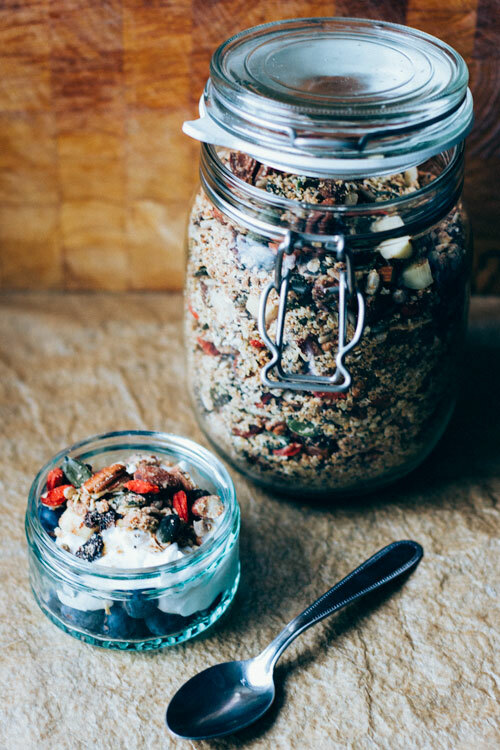 Everyone needs a good granola in their cupboard and even though there are some great products out there now for gluten frees it’s such an easy thing to make yourself. 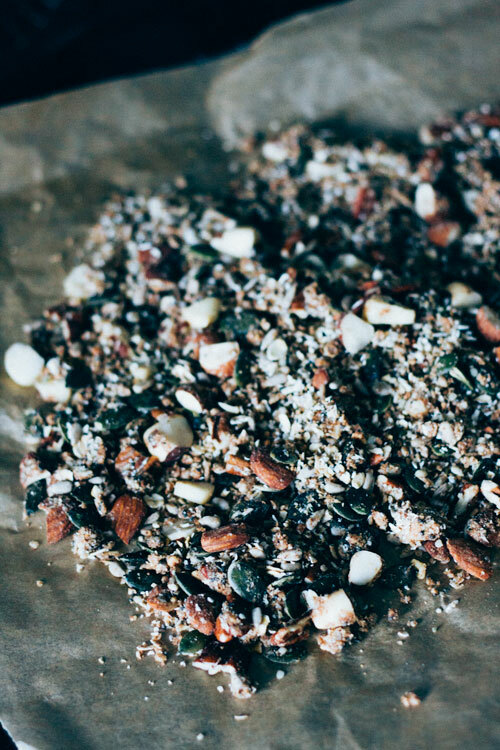 This recipe combines a heap of seeds and nuts with oats as well as some dried fruit for a luxe granola. It is easy to simplify by simply using what’s available in your cupboards. That’s one of the great things about granola; most things work! Nuts and seeds, seeds and nuts – you know what I’m going to say! Protein, minerals, healthy fats, antioxidants and the list grows longer with health benefits. Nuts and seeds really are one of the building stones for a vegan and gluten free diet! And for a healthy lifestyle! Make sure that you get gluten free oats if you are new on the gluten free field. Sometimes they are called pure oats too. 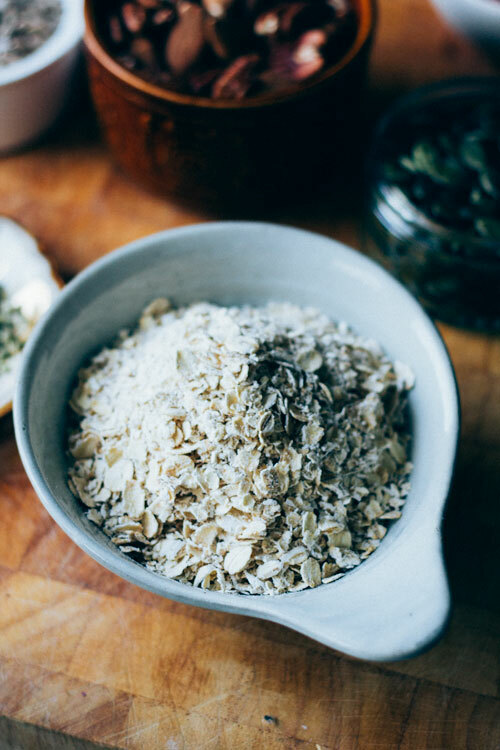 Oats contain a lot of fiber which is great for digestion and keeping your gut smiling. It is another food that can help prevent type two diabetes, keep blood sugar level and keep cholesterol levels healthy! I added some extra superfood power to this recipe by adding maca powder and other powders could work as well. Try cacao powder or lucuma! Now let’s finish this section by talking about goji berries. The superfood that’s been on topic for the last couple of years is a red berry that is used dried in this recipe. It has been used in chinese medicine for thousands of years and it seems to be here to stay. I’m happy about that because these berries have great benefits like being packed with antioxidants which help keep your body clear of free radicals that are nasty to the cells. Other benefits are vitamins such as vitamin C for a healthy immune system as well as the antioxidant zeaxanthin which protects your eyesight. I also added some extra superfood power to this recipe with maca powder. Makes one extra large jar. Active cooking time 15 min, total cooking time 60 min/3h 15 min. Preheat oven to 100 degrees celsius or prepare to use dehydrator at 113 degrees fahrenheit. Prepare 2-3 oven/dehydrator trays with baking paper. Chop nuts into smaller pieces. Mix all dry ingredients in large bowl except for dried fruits. Add all wet ingredients and mix. Spread mixture out onto baking sheets and place in oven/dehydrator. Bake for 45 min – mix halfway through / Dehydrate for roughly 3 hours. 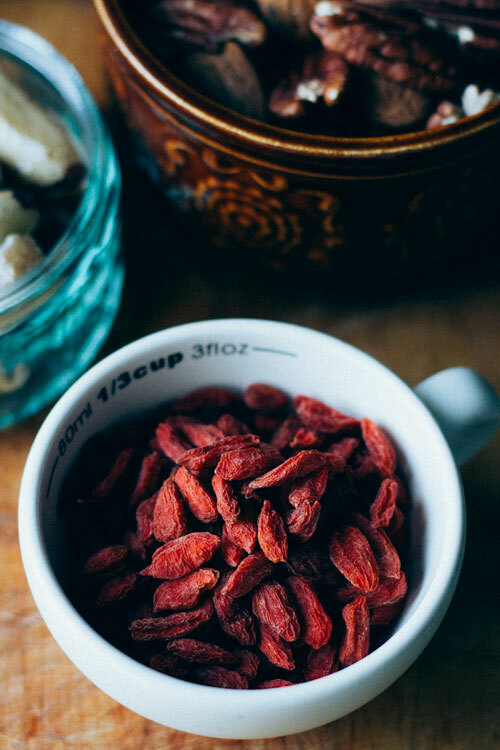 Place back into bowl and mix with dried berries/fruits. Keep in airtight jar or tupperware. Enjoy as a topping to coyo, soya yoghurt and smoothies for a nourishing breakfast!